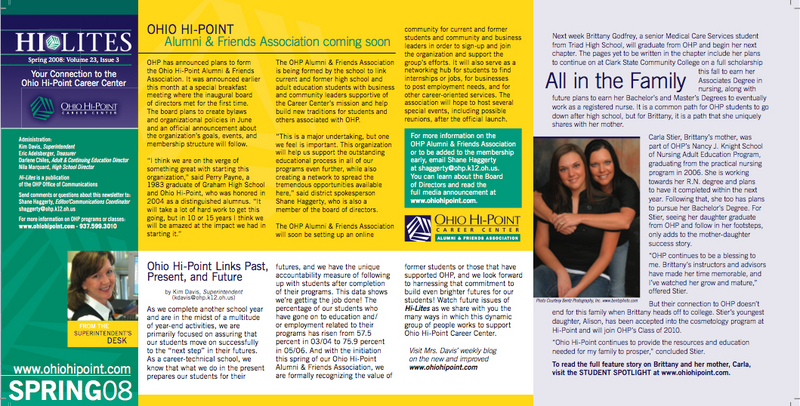 I manage the marketing and communications at the Ohio Hi-Point Career Center. While overseeing the marketing efforts of the entire school district, I also work with the media, write news releases and district publications, and strategize on how best to engage prospective students for both the high school and adult education programs. My career started out as an English teacher at Crestview Schools in Convoy, OH, where I taught English courses for two years. After this, I served as athletic director and dean of students for three years until returning to the classroom for one more year, this time teaching English/mass media and serving as the district's PR director. During my time at Crestview I earned my master's degree in educational leadership from the University of Dayton, as well as my principal's licensure. Following this, I made the decision to return to school full-time and explore a new career. After receiving a graduate assistantship at Xavier University, I studied sports management with an emphasis in marketing/PR. I completed internships with the Xavier Sports Information Office and worked with GameDay Communications. In August of 2005, I graduated with a master's degree in sport management. From 2006-2007, I served as an instructor of marketing, sales, and advertising at Rhodes State College in Lima, OH, and conducted various freelance marketing and PR work. In 2007, I accepted my current position at Ohio Hi-Point Career Center. I also recently became the social media strategist of a new entrepreneurial venture called mywebWOW!, which provides small business website and marketing solutions in Columbus, OH. I am a frequent speaker and presenter on the topic of social media marketing having given workshops at various professional conferences and workshops. I have also consulted on social media projects with Experience Columbus, Ohio Department of Education, NBC4 Columbus and various small businesses and organizations. I work with the board of directors as the vice-president of professional development of the National School Public Relations Association Ohio Chapter in planning professional development opportunities for our Spring Conference in Columbus, Ohio in 2009. Oversee and manage the marketing and public relations for Ohio Hi-Point, a career-technical school located in Bellefontaine, OH. The district operates on a main campus, housing a high school, adult and continuing education school, and college branches in partnership with Clark State, Urbana University. The district also operates 25 high school satellite programs in its five county service area with 14 partner high schools, as well as an upcoming South Campus in Urbana. The adult education school has satellite sites in Marysville, Kenton, and Urbana. My role includes media relations, community relations, website management, writing and editing, event planning and coordination, media buys, working with graphic designers, printer services, and other marketing companies, as well as consulting with various departments on collateral and presentations. I also handle all social media campaigns and social media communications. The first part-time social media strategist for mywebWOW!, an affordable small business web design solution based in Columbus, OH. It is a website design company that will provide you an affordable, customized, friendly way to turn your dream into BIG business. We offer a full complement of web design and development services, branding and logo design, personalized full-service online and print marketing. Taught courses in and developed curriculum for marketing 101, advertising and promotions, and sales techniques. During my graduate work at Xavier University, I received an assistantship position and worked in the Office of Student Life as a programming coordinator. I was in charge of special event planning and management during various student activities and fundraisers throughout the school year. Taught middle school and high school English classes for two years and then served as the Dean of Students/Athletic Director for three years. From 2003-2004 I taught English and mass media courses and worked as the school district's PR person. Experienced media relations skills in building relationships with reporters, pitching stories through both traditional means and the use of social media at the local, regional, state and national levels. Expertise in planning marketing and communication strategies around social media tools such as Facebook, Twitter, Linkedin, blogs, YouTube, Flickr, Delicious, Digg and more.